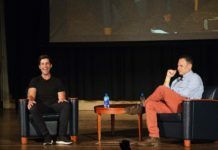 On Monday, April 23, the University of Rhode Island’s Hillel Center hosted Israeli comedian Joel Chasnoff to commence their weeks long celebration of Jewish life. This marks Chasnoff’s second visit to URI as he appeared at the dedication of the Hillel Center in 2010. This time it’s to celebrate Israel’s 70th birthday. Chasnoff then went on to perform and teach improv to various audiences all over the world, sharing his comedy for Jewish events all across North America, Europe and even on Israeli television. 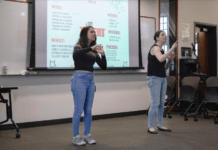 That was only one part of Chasnoff’s interactive theatre experience in his show titled, “Israel – What’s the Story?” Throughout the show, Chasnoff displayed a lively interest in his audience members including them in many of his jokes. He described stand up as being challenging because each audience you face is it’s own “beast” and depending on the crowd size and how much they appear to know about the topic of Israel, each one requires a different amount of engagement. In this particular show, humor about growing up Jewish from going to Jewish Day School to his basketball team always losing due to constantly having to fix their Yarmulkes. 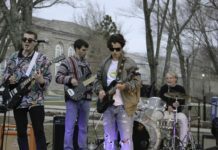 Chasnoff used his Jewish experiences to connect with his audience who were mostly Jewish students and community members. Towards the end of the show, Chasnoff introduced to the audience to four different characters with different personas, accents and perspectives on Israel and its role in the International community. Taking the form of an Israeli Officer, a lawyer from New York, a Rabbi from Georgia and a young man whose opinion was to do away with Israel entirely, Chasnoff opened the floor to any questions. He allowed the audience to ask questions of any of the characters, making sure to make his swift costume change in between questions. If anything was to be taken away from his show, it was Chasnoff’s way of making his goal clear to his audience. He was there to talk about Israel in a way that they don’t feel they are being preached to or told what to think. At the show’s conclusion, Chasnoff was available for further discussion and many of the students took advantage of this. He even had his memoir available for purchase. With Israel being an often uncomfortable topic of debate among different ideological lenses, Chasnoff’s show was a safe space in which anyone was able to express their own opinion. Speaking of the proposition to move the United States embassy from Tel-Aviv to Jerusalem, Chasnoff expressed that it sounds like a very Pro-Israel sentiment, but for Israelis living there it could be negative because it causes more tension. Surely, anyone who had attended the show was in for a night of humor and debate well received.